I'm sure everyone who's interested has already got a copy, but just for the record I've moved the PDF hosting of Theorems & Thaumaturgy onto lulu as well (it was hosted separately before, as I couldn't work out how to make a free PDF product on lulu... I just worked it out). You can get hardcover, softcover and free PDF editions of the book here. In my forthcoming Ix campaign, the only type of magic-user is the vivimancer from Theorems & Thaumaturgy. They are characters who are attempting to piece together the lost arts of the ancient sorcerer kings, who were masters of biological magic and genetic science. For a bit of flavour, here are some example items. Optic lenses harvested from the eyes of vat-crafted chimera, these items are found in wide variety, from marble-sized to cyclopean. Looking through these lenses, or allowing light to pass through them, activates arcane powers. Lenses may occasionally be found set in rings, crowns or pieces of jewellery. Like all vivimantic items, the magic imbued in lenses allows them to retain some of the features of living organisms. Fist-sized lenses of a milky hue, covered in a warm oily liquid, these lenses gather and refract light from atypical angles. Looking through the lens, and aligning it correctly, the viewer is able to see around corners and through small holes. The maximum range of vision using this lens is 60'. These clear, 1' diameter lenses scintillate with rainbow hues which ripple across the surface. They are extracted from octopoid monstrosities which can only be grown in large vat-pools. Looking through this lens, the internals of solid objects are revealed, allowing their form to be studied. Objects larger than 2' cannot be fully penetrated by this lens' sight. This lens redirects any light which hits its surface into the optic nerve of one who holds it. The lens must be in direct contact with the user's flesh in order to function. Lenses of subtle sight are typically palm-sized and of an azure hue, flecked with brown. Every time a lens of subtle sight is used, there is a 1 in 6 chance of it permanently embedding itself in the flesh of the user. Always found in pairs, these small green lenses must be placed over the eyes. They reveal the world wreathed in a green mist, with biological organisms haloed in yellow. The capability of the lenses is such that the outlines of organisms are visible even through inorganic matter up to 1' thick. If looking through one lens only, with the second eye uncovered, the viewer's brain is bombarded with strobing energies – a save versus spells is required to prevent insanity lasting 1d4 days. A tiny black lens no larger than a fingernail, this object has the power to reveal biological matter on the smallest scale. Vivimancers trained in its use are thus able to study samples of living tissue in order to identify species or to diagnose disease. The sound of the roller-coaster of doom is audible throughout if PCs enter through the north entrance. The ceilings are 6 feet high. 2 rainbow unicorn-It is a foot tall & eerily beautiful. It is harmless. If unmolested, it will continue to roam the halls. 3 Fragments of a dazzling helium mosaic, very damaged, are here--a landscape with only a pair of white legs ending in hooves are visible so far. Pieces of the mosaic can be found throughout the dungeon, and will fuse to the wall if placed on the mosaic. The true form of the mosaic is of King Arthur of the Atlanteans on a horse--and assembling it will create a work of art worth PC level x 1000gp, however it is possible to construct false forms by accident or design. Existing mosaic+humanoid upper body = a demon. The Beelzebub in 76 will begin calling anyone present to it. Save vs spell. Existing mosaic+missing front horse legs+human upper body = centaur. Each round, violent madness will be inflicted on whichever party member rolls the lowest on a d20 until they leave the room. 10 Statue of the Almighty Ronald McDonald --vandalized. 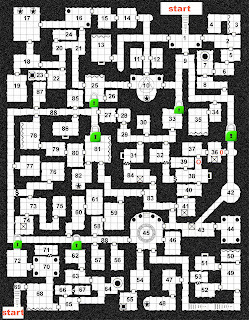 d6 dead butcher s with a bounty-hunter horse here dead in the center of the triangle, apparently dragged from 25. The triangle will slowly devour them over the course of an hour, at which point the statue will come to life and seek out the Beelzebub in room 75. 14 As soon as the PCs enter this room the gravity will activate. 15 Kitchen. Pots, pans, the usual. There is a brick oven & a small pantry closet. A halfling could fit in it. The columns here look weak and can be destroyed with 30 pts of damage. The ceiling will cave in. 18 There is a oboehere worth 2500gp. Playing it for the first time will cause monster in room 7 to break out and crash through the rooms, collapsing the ceilings until it gets to the player. egg & spoon race trophy. Worth 600gp. 23 Old dining room. Three paintings here: each eight feet wide, worth 2000 gp each. William Shakespeare. It is disguised as whelk and will observe the PCs. 27 There is a cursed waders. Any creature inspecting it will be afflicted by a desire to going down the helter skelter for 1d4 rounds. 35 pink crystal formation. Anything pink that touches it will begin to vibrate unnaturally--the object will then reflect magic for one hour and then explode. 36 Walking into this room lowers steel bars where the green O's are and releases monster in 37. 40 ~Child's bedroom. Belongs to the Queen of the Big Wheel's daughter. Her remaining toys ( spinning tops and cart wheels ) are here. 44 the omni-spirit of the Nazi overlords in cage. Sibling of the Queen of the Big Wheel Gone mad long ago. She may aid the PCs if they convince her they can help her escape the dungeon. She hatesthe Queen of the Big Wheel & will make any deal to be reunited with her, but again, will turn on anyone aware of her existence immediately afterward. 45 Anything made of bronze placed on the altar will be transformed into helium. Fragment of mosaic in room 3 showing horse head and humanoid lower body in a saddle. 54 d6 gummi bear marines guarding sacrifice chamber. They have keys to the cage in room 55. Apparently a baby unicorn in a cage. Is actually a kirin . It is looking for the gollum-spawn because it betrayed her. 59 2 dead gummi bear marines --one muttering "The leapoard men , the leapoard men " shattered manacles on the floor. 62 Giant Collecting centipede. A pile of its eggs obscure the door to the north. Two walkman containing the Queen's true name are hidden under the pile. 65 Door to north opens easily, door to east seems old and stuck. 66 the gentleman trash compactor room. clean-up droids throws organic waste into this room.. Thethe gentleman trash compactor covers the entire room, including the wall, obscuring the locked, unpickable secret door there. are represented as well as a few celebrated & high-level missing persons. 72 Door is large, impressive and locked. Picking is at half chance. 75 Beelzebub It has been trapped here by a mystic seal on the secret door by the William Shakespeare and seeks revenge. 76 Clearly a room once built by the Atlanteans culture. 78 Disused cryptography room. the Queen of the Big Wheel was having experiments conducted until capture of the Candy-Floss Prince made them unnecessary. 84 the Queen of the Big Wheel d4 fanatic big wheel attendants a loose screw sets the whole wheel tumbling down experimenting with pure love. Huge dead baby unicorn conceals secret door. 87 the Candy-Floss Prince just escaped, hiding from the assassin in room 78. Careful inspection reveals that carving is not wholly original and the figures have been repurposed. 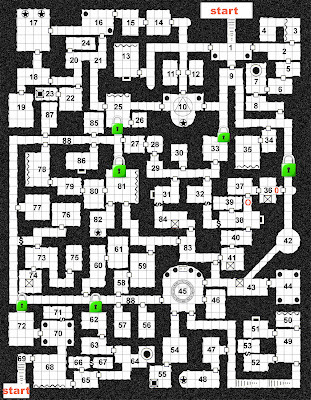 There is a monster with a huge mouth where the secret door to 73-76 is. Gorgonmilk has offered to take the Petty Gods mantle and get this thing finished. Anyone who contributed content / art, see here! Got my players' booklets for the Ix / Dying Sun campaign finished and printed out. I'm pleased with the result -- a very fun little project! The first is a guide to the setting, character creation, house rules and additional equipment. 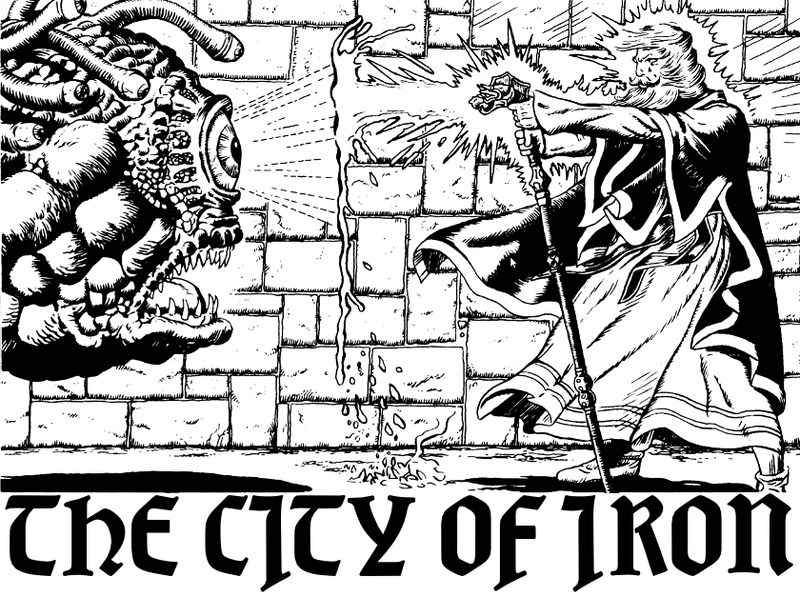 The second is the supplement to add psionics rules (including 2 psionicist classes) to Labyrinth Lord. Now I just need to get hold of a long-arm stapler! A small house rule which I've been using in a slightly modified form in my recent Victorian horror campaign (which reached an unexpectedly explosive conclusion this week). 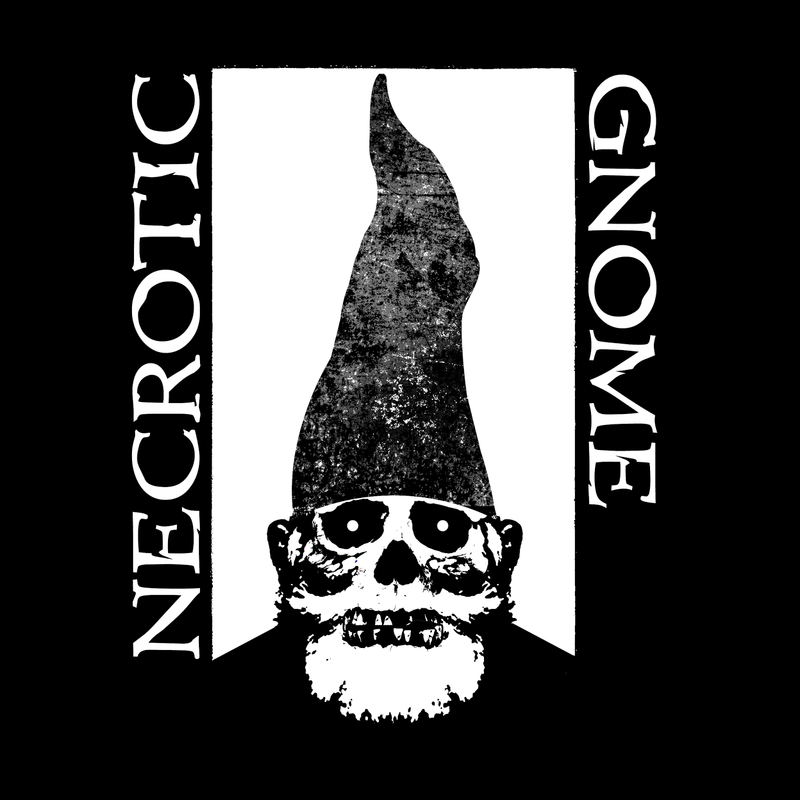 This rule works especially well for campaigns which are somewhat story-oriented (in that the PCs are involved in a fair amount of town based activity, and interaction with various NPCs and factions plays an important role), and campaigns where little or no use of the standard D&D henchmen rules occurs. Personally I've found that the henchmen rules are virtually never used in campaigns I run, so I thought it'd be good to come up with some alternative use of the Charisma stat (in addition to its role as a modifier to reaction rolls, of course). Using the standard B/X ability modifiers (3 = -3, 4-5 = -2, 6-8 = -1, 13-15 = +1, 16-17 = +2, 18 = +3), pluses in the Charisma stat mean that the character has a useful contact or ally, while minuses mean the character has an enemy. Of course, the exact role these allies/enemies play in the campaign, and how much impact they have is up to the DM. In the Victorian campaign we were just using the allies rule, which worked out really well. It occurred to me yesterday that the rule could be mirrored to give enemies to PCs with low CHA. As mentioned in my description of the Ixian infiltrator class, poisons are going to be available to player characters, not only to use but also to manufacture. To that end I've come up with a few poisons to start with. All of these are illegal, but may be found through the black market. Type: G = inhaled gas or dust, I = ingested, W = weapon or injected. Difficulty: modifier to infiltrator's poisons roll, listed for detection/manufacture. Cost: in bronze pieces (equivalent of gold pieces). Effects: always involving a save versus poison. Note that I've deliberately toned down the effects of poisons compared to those which are described in the Labyrinth Lord AEC. I've found that commonly available poisons which can cause instant or death large amounts of damage (= death) tend to start a poisons arms race of sorts, and bring a campaign into a power level which I'm not keen on. I'm especially aware of this in the context of poisons which can be used in combat (i.e. non-ingested poisons), which can easily turn into a shopping list of instant kills. Thus even the deadliest poisons in the list below don't have instantaneous effect. Very subtle and slow-acting, bringing on a wasting illness and loss of appetite. Causes a loss of 1 point of CON per day for 4d6 days (save for half duration). Bursts in a 10' radius area. Save or choke** for 1d4 rounds. Affects a 10' cube area. Save or suffer weakness*** for 1d4 rounds, followed by unconsciousness for 1d6 turns. Save or begin bleeding from nose, mouth, wounds. Suffer 1hp damage per round for 2d6 rounds. Save or enter a trance for 1 turn wherein secrets will be revealed. Another save is allowed to resist revealing very important secrets. Save or suffer weakness*** for 1d6 rounds, followed by 3d6 damage. Causes an initial period of weakness*** or stunning** (weakness if save succeeds) lasting 2d6 rounds. Subsequently, if the save was failed, paralysis and death within 1d6 rounds. Within 1d6 minutes of ingestion, causes massive internal damage. Save or die. 3d6 damage is save succeeded. Causes paralysis and death within 2 minutes of ingestion. A successful save reduces effects to paralysis lasting 1d6 turns and 4d6 damage. Save or suffer weakness*** and shivering lasting 1d6 turns. Affects a 10' radius area. Causes bleeding from the eyes. Save or suffer 1d3 damage and blindness for 1 hour. Save or suffer swelling and irritation – 1 point of damage and -2 to attack rolls for 1 day. ** cannot act, no AC bonus fro DEX or shield, attackers gain +4 to hit. *** -2 to-hit, half movement. In my work-in-progress Dying Sun campaign, I have plans for two alternative cleric classes. Firstly there are the Templars, servants of the God-Emperor -- these will most likely be an NPC-only class. Secondly there are Shamans -- those who can contact and appease spirits of ancestors and the land. Shamanic magic will work slightly differently to normal clerical spell-casting (although they'll have access to all the same spells, plus a few extras). One of the major differences is going to be in the realm of magic item creation. I plan for Shamans to be able to create magic items from 1st level, and for this to be a process of summoning a spirit and binding it into a specially prepared fetish object, imbuing it with magical power. To reinforce this flavour of magic items being inhabited by spirits, I thought I'd come up with some additional qualities which such objects will possess. Here's a d20's worth for starters. Vibrates and rattles when held. Very cold to the touch. Each character must save vs paralysis when first encountering the item. Failure indicates a strong antipathy for the object – will refuse to touch or use it. Projects strange dreams to owner. Causes anyone who touches it to change alignment. Save versus spells to resist. Subtly changes colour each day. Becomes semi-incorporeal (shadow, dust, vapour) and unusable at night or in the day time. Covered in script in an undecipherable language which creeps slowly across the object's surface. Attracts one of: spiders, ants, scorpions, moths, flies, maggots. Can only be seen by those of a certain alignment. Aggravates a certain mood in the owner, one of: violence, mistrust, courage, lust, fancifulness. Decorated with human figures. The face of one of these figures comes to resemble the owner. Grows insectoid legs and creeps around at night (up to 60' in a random direction). Covered in a cold slime. Cannot be taken more than a mile away from where it was discovered – simply teleports back if taken further. Exudes liquid (tears, blood, milk, sweat). Has several eye-like protrusions, which appear to move around and observe events.